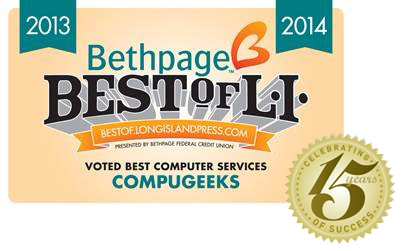 Compugeeks Wins “Best of Long Island” Award Two Years in a Row! IT Support 2.0 shifts all the responsibilities associated with IT to Compugeeks and provides you with a Virtual Chief Information Officer to lend expertise. Compugeeks becomes your IT department for you for a predictable monthly fee. Compugeeks is the leading provider Hosted Exchange. Users of older versions of Exchange as well as POP email users will benefit from the enhanced features of Exchange 2010 and 2013. Email has never been better! Whether you need assistance in developing your IT strategy or want to take advantage of the latest technological advances, our team will ensure your project is designed and delivered to meet the requirements of your budget.